Articles tagged with "layne beachley"
Posted in: Surf culture, Top stories. Tags: Damien Hardman, layne beachley, Occy, Tom Carroll. Your correspondent wandered down to the final afternoon of the Manly Festival of Surfing to catch the celebrity challenge. The weather was not kind and Huey was in one of his moods. Of course the pros are used to making the best of marginal conditions and despite the unobliging weather, there were a fair few folk on hand to watch. As usual it was a revelation to watch just how much speed these folks were able to extract from the utterly gutless junk. Tom Carroll was particularly impressive. No matter how weak the wave, he somehow managed to steadily build up his speed so he was in a position to do something if the wave so much as offered a foot of clean face. Damien Hardman and Layne weren’t more than a few tenths of a percent behind in this department. Occy showed that he still has it as well, but the waves in his heat were few and far between, so we only got one or two flashes from the master. That said, he still has the kind of 1000 watt personality that pulls the crowds. At the same time he seemed to genuinely get a kick out of the groms who shyly edged up to request an autograph. Posted in: Contests, Local Colour, News Stories, Surf News. Tags: 2009, Commonwealth Bank Beachley Classic, Dee Why, layne beachley, Rebecca Woods. Rebecca Woods (AUS), 25, current ASP World No. 8, eliminated seven-time ASP Women's World Champion Layne Beachley (AUS), 37, in Round 3 of Commonwealth Bank Beachley Classic competition today, which was offically Beachley's last heat on the ASP Women's World Tour. DEE WHY, New South Wales (Saturday, October 3, 2009) – The Commonwealth Bank Beachley Classic got back underway today when the world’s finest competitive female surfers were greeted with stormy three-to four foot (1.5 metre) surf at Dee Why and completed two rounds of competition. Today’s action saw surfing icon and seven-time ASP Women’s World Champion Layne Beachley (AUS), 37, fall to Rebecca Woods (AUS), 25, in Round 3 in what was officially her last professional heat while reigning two-time ASP Women’s World Champion Stephanie Gilmore (AUS), 21, was victorious in a highly anticipated rematch over defending event champion Tyler Wright (AUS), 15. Woods, who relegated Beachley to Round 2 in their opening Commonwealth Bank Beachley Classic bout, eliminated the ASP Women’s World Tour veteran from competition today when they faced off in the tricky Round 3 conditions at Dee Why and advanced through to the Quarterfinals. The talented Australian has yet to advance past the Quarterfinals in the first two events of the2009 calendar and is hoping to break through to the Semifinals at this year’s Commonwealth Bank Beachley Classic. Beachley was unable to find a rhythm in what would be her career-last heat and logged her career-lowest heat total (a .50 out of a possible 20) while bowing out to Woods, but her tough luck in the Round 3 matchup has no reflection on the illustrious champions previous accomplishments. After an impressive Round 2 performance, Beachley was unable to find a rhythm against woods and posted only one small score before the clock ran down in her heat. Gilmore, who is the current ASP Women’s World No. 1, eliminated defending event Champion, Wright, in a low-scoring affair. Wright caught a last-second wave and was unable to clinch the small score needed to advance over the reigning ASP World Champion, opening the door for Gilmore to advance through to the Quarterfinals. After falling to the prodigious young Australian in Round 3 of last year’s Beachley Classic, Gilmore approached the rematch against Wright with more caution and her tactics allowed her to come out on top in this year’s battle. Silvana Lima (BRA), 24, who is the current ASP World No. 2, bashed the day’s highest heat total, an impressive 16.00 out of 20, with committed forehand surfing on the thumping Dee Why right-handers. Lima, who is fresh off of her first career victory at Bells Beach and a two-time Beachley Classic runner-up, is hungry to claim back-to-back wins and is ready to better her result at this year’s Commonwealth Bank Beachley Classic. Lima will face fellow Brazilian Jacqueline Silva (BRA), 30, in Quarterfinal No.3 when competition resumes. Posted in: News Stories, Surf history, Top stories, Video. Tags: Cape Solander, layne beachley, Ours, Tim Bonython, video. If you haven’t seen it yet, Layne Beachley at Cape Solander (video hosted on surfline.com)(aka “ours”). It was shot by none other than Tim Bonython. Very, very impressive pit! Pic grabbed from online ver. of video by Tim Bonython. Posted in: Contests, News Stories, Surf News, Top stories. Tags: 2008 beachley classic, asp world tour event, layne beachley, Manly, nsw, tyler wright, youngest ever. Australia’s Tyler Wright (AUS/Culburra/Sth Coast NSW) created history today becoming the youngest ever surfer to win an ASP World Tour event. At just 14 years of age Wright won the Beachley Classic, Women’s surfing richest event with $US100 000 in prize money – Wright defeated Brazilian Silvanna Lima in the final. MANLY BEACH, Australia (Monday, October 13, 2008) – Tyler Wright (AUS), 14, made ASP History today as the youngest ever winner of an ASP World Tour event, defeating fellow finalist Silvana Lima (BRA), 23, at the Beachley Classic in peaky two foot (1 metre) waves at Manly Beach. Stop No. 5 of 8 on the 2008 ASP Women’s World Tour, the Beachley Classic was treated to dramatic action all week, with the increased 20% ratings points wreaking havoc on the 2008 ASP Women’s World Title race before culminating in Wright’s historic win. Wright, who gained entry into the Beachley Classic after her impressive win at the Oakley Trials last Thursday, went on an absolute tear, defeating reigning ASP Women’s World Champion Stephanie Gilmore (AUS), 20, Jacqueline Silva (BRA), 29, and Amee Donohoe (AUS), 27, en route to her Finals berth with Lima. The young natural-footer has been on a tear lately, qualifying for the prestigious Billabong ASP World Junior Championships last week before going on her giant-slaying here in Manly this week. Lima was in awesome form on the final day, ripping from the Quarterfinals through to Final before coming up just short in the Final, repeating her performance from last season. Despite the disappointing loss to Wright, the Brazilian’s runner-up rockets her into 5th place on the ASP Women’s World Tour ratings and places her well into the race for the 2008 ASP Women’s World Title. “It’s really tough for me – I wanted to win, but it still feels pretty good because I’m moving up in the rankings just as the tour moves into South America,” Lima said. Sofia Mulanovich (PER), 25, former ASP Women’s World Champion and current No. 1 on the 2008 ASP Women’s World Tour ratings, took over the lead from reigning ASP Women’s World Champion Stephanie Gilmore (AUS), 20, last Saturday, was in excellent form today, securing an impressive 8.67 out of a possible 10 in her Semifinal bout before succumbing to an ankle injury. “On my last turn of the wave I injured my foot it’s very frustrating but it happens all the time,” Mulanovich said. “I’ll just try and get my foot better and think to myself this is not a bad injury. I’ll get back for the next event”. While the ankle injury remains a concern, Mulanovich is pleased with her equal 3rd place finish in the Beachley Classic and will head into her hometown of Peru as the No. 1 seed on the ASP Women’s World Tour. Amee Donohoe (AUS), 27, current No. 4 on the ASP Women’s World Tour, was in fine form this morning before succumbing to the wildcard Wright in the Semifinals. Layne Beachley (AUS), 36, former seven-time ASP Women’s World Champion and current No. 3 on the ASP Women’s World Tour, had her Beachley Classic run halted by Lima, but is still a major contender for the ASP Women’s World Title and will look forward to the next event in Peru. The next stop on the 2008 ASP Women’s World Tour will be the Movistar Classic Mancora Peru presented by Rip Curl from November 3 – 8, 2008. Tyler Wright with Layne Beachley. Posted in: News Stories, Surf News, Top stories. Tags: 2008, 7X ASP Women's World Champion Layne Beachley Announces Retirement, beachley classic, layne beachley, Manly. Layne Beachley (AUS), 36, former seven-time ASP Women’s World Champion and current No. 3 on the 2008 ASP Women’s World Tour, officially announced her retirement from full-time competition today, effective at the end of the season. 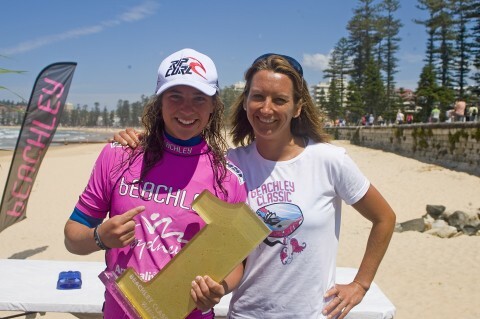 Beachley is competing this week at her signature event, the Beachley Classic, held in Manly, Australia. “I feel like I’ve created a legacy and that’s something to be incredibly proud of,” Beachley said. “I’ve instilled hunger and passion into the future generations of female competitive surfing coming up through the ranks. I know Steph (Gilmore) looks at me and wants what I got. It was Lisa Andersen before me that gave me the motivation to become seven-times ASP Women’s World Champion. That kind of drive and dedication that it takes to be a champion is the legacy I think I am leaving behind and it’s something I’m very proud of. Posted in: Manly, Surf Reports. Tags: 2008 beachley classic, chelsea hedges, layne beachley, Manly. Great swell. The girls are in the water. Get on down there if you can.